RNLI Temporary RNLI lifeguard service at Camber Sands after five people died this week. Lifeguards will be deployed this bank holiday weekend at the popular beach where five young friends died during a day trip to the coast. In response to recent tragic events at Camber Sands, the RNLI is working with Rother District Council to provide reassurance to the public by providing a temporary RNLI lifeguard service which will work alongside the existing local authority personnel. The charity will provide a team of 5-6 lifeguards and appropriate equipment over the bank holiday weekend (Saturday – Monday) 9am-6pm on Camber Sands who will work alongside the Local Authority Beach Patrol teams. The Royal National Lifeboat Institution offered to provide lifeguards over the weekend and the Council accepted. In addition to the lifeguard service the RNLI will also be providing a Face-to-Face team who will be on hand to provide key safety information to all visitors at the beach. A Rother District Council spokesman said: “We very much welcome and appreciate the support the RNLI are offering to provide a temporary lifeguard service. 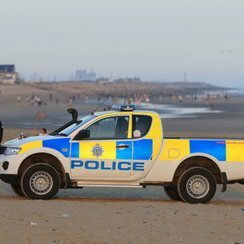 “People are understandably concerned in the light of the tragic incident at the beach this week and this service will provide reassurance to the public in one of the busiest weekends of the year at Camber. Council officials said the temporary RNLI lifeguard service at Camber Sands, near Rye in East Sussex, is designed to ``reassure the public and advise on safety''. The development follows the deaths on Wednesday of five men, named locally as Inthushan Sri, 23, Nitharsan Ravi, 22, Kurushanth Srithavarajah, 26, and brothers Kobi Nathan, 21, and Ken, 19, all from London. Relatives of some of the men have criticised the lack of lifeguards at Camber and suggested they may have stood a chance of survival if the beach had been manned. Mr Ravi's family said they felt ``very angry'' at the lack of response from the authorities following the death of another man, Brazilian Gustavo Silva Da Cruz, 19, at Camber last month. Ken and Kobi Nathan's father, Satthiyanathan Arumukam, 51, of Erith, south-east London, told The Sun: ``I brought my children from Sri Lanka because it is not safe back there. A spokesman for Rother District Council said that, despite there being no lifeguards, there were summer patrols to advise people of potential dangers. In recent years, Camber has attracted people from outside the area who were unfamiliar with the sea and the dangers it poses, he added. An online petition started a month ago to campaign for lifeguards at Camber has now reached more than 6,800 signatures. Local resident Emily Van Eyssen, 44, said money raised through car parking charges at Camber should fund lifeguards there throughout the summer. The five men had gone to the coast for a day trip from London. Mr Ravi's brother said his brother died after trying to rescue two of his friends who had become trapped beneath the water. He said attempts failed and Mr Srithavarajah was brought out first and declared dead straight away. Both died within 15 minutes after being pulled from the water, he said. The bodies of Ken Nathan and Mr Sri were discovered later that evening, he said, adding that he thought they had got their legs caught in the ``slippery mud'' and sand on the seabed.